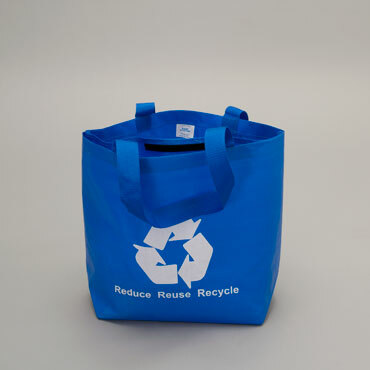 This tough waterproof-coated reusable woven-fabric bag is made for multi-family recycling, and it’s reasonably priced to make your recycling program even better! Hundreds-of-thousands of Bagit Multi-Family Totes are in use in large North American municipalities, universities and institutions. Available in standard size and configuration, or custom designed, built, and printed to your specifications. Standard color: mid-blue fabric with mid-blue handles. Custom colors and full-color Gravure printing available. 1,000 pc minimum quantity. Approx. finished weight: 5.5 oz.